Legal Resources Foundation Zambia is a non-profit Foundation, established in 1993 providing legal aid, promoting human rights and conducting litigation in the public interest. 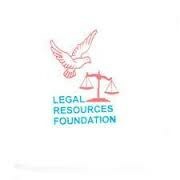 Legal Resources Foundation is the leading provider of legal services to financially disadvantaged persons in Zambia. The LRF has a registered law firm namely the Legal Resources Chambers (LRC). LRC employs lawyers under the Foundation who provide free legal representation to litigants in court. The LRC is headed by a Principal Advocate and lawyers who litigate in all matters of the Foundation. LRF has a Board as the policy-making organ and a management team that oversees the implementation of programmes and the policies. Professional services are provided by lawyers under the LRC. Paralegals and support staff carry out the actual implementation of the programme activities of the Foundation. Each year the Foundation helps about 35,000 people through its range of services including legal advice, impact litigation, pre-trial and legal education. The Foundation’s legal aid services, prison visit programme and actual representation in courts of law are extended to other vulnerable groups such as refugees, prohibited immigrants and juvenile offenders. The secretariat is situated in Lusaka with eight other provincial offices in Kitwe, Livingstone, Kabwe, Kasama, Chipata, Mansa, Solwezi and Mongu.